The major goal of our mission is to survey shark populations in the western Gulf of Mexico and collect measurements and biological samples. The sharks are also tagged so if they are re-caught scientists can learn about their growth and movements. Sharks are members of the class of fishes called Chondrichthyes,which are cartilaginous fishes meaning they have an internal skeleton made of cartilage. Within the class Chondricthyes, sharks belong to the subclass Elasmobranchii together with their closest relatives the skates and rays. There are about 450 species of living sharks that inhabit oceans around the world. Sharks, or better put their ancient relatives, have inhabited the oceans for approximately 450 million years and have evolved a number of unique characteristics that help them survive and thrive in virtually all parts of the world. The most recognizable feature of sharks is their shape. A shark’s body shape and fin placement allow water to flow over the shark reducing drag and making swimming easier. In addition, the shark’s cartilaginous skeleton reduces weight while providing strength and flexibility, which also increases energy efficiency. 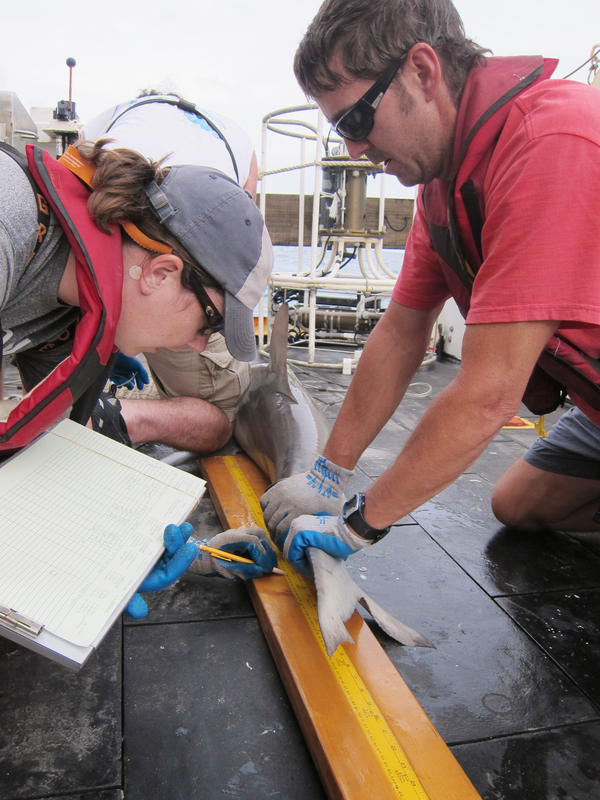 Measuring a blacktip shark on deck. The blacktip shark shows the typical body shape and fin placement of sharks. These physical characteristics decrease drag and help sharks move more efficiently through water. When I held a shark for the first time, the feature I noticed most is the incredible muscle mass and strength of the shark. The body of a typical shark is composed of over 60% muscle (the average human has about 35-40% muscle mass). Most sharks need to keep swimming to breathe and, therefore, typically move steadily and slowly through the water. This slow, steady movement is powered by red muscle, which makes up about 10% of a sharks muscle and requires high amounts of oxygen to produce fuel for muscle contraction. The other 90% of a sharks muscle is called white muscle and is used for powerful bursts of speed when eluding predators (other sharks) or capturing prey. Since sharks are so strong and potentially dangerous, one lesson that I learned quickly was how to properly handle a shark on deck. Smaller sharks can typically be handled by one person. To hold a small shark, you grab the shark just behind the chondrocranium (the stiff cartilage that makes up the “skull” of the shark) and above the gill slits. This is a relatively soft area that can be squeezed firmly with your hand to hold the shark. If the shark is a bit feisty, a second hand can be used to hold the tail. Smaller sharks, like this sharpnose shark, can be held by firmly grabbing the shark just behind the head. Larger and/or more aggressive sharks typically require two sets of hands to hold safely. When two people are needed to hold a shark, it is very important that both people grab the shark at the same time. One person holds the head while the other holds the tail. When trying to hold a larger, more powerful shark, you do not want to grab the tail first. Sharks are very flexible and can bend their heads back towards their tail, which can pose a safety risk for the handler. While holding a shark sounds simple, subduing a large shark and getting it to cooperate while taking measurements takes a lot of focus, strength, and teamwork. 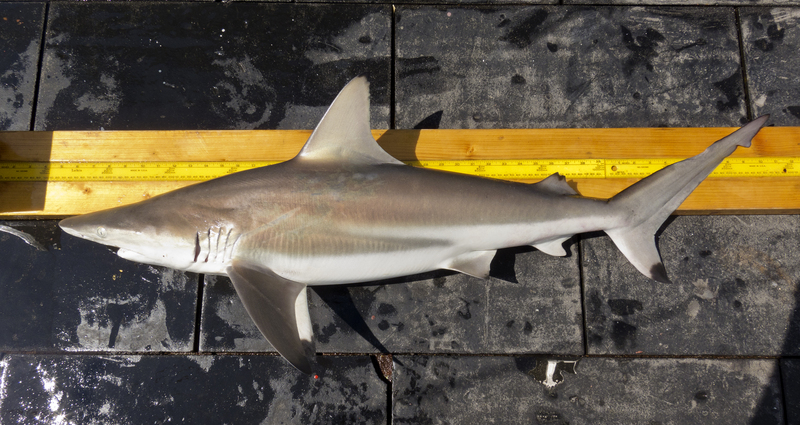 Teamwork is required to handle larger sharks like this blacktip shark, which was caught because it preyed on a small sharpnose shark that was already on the hook. 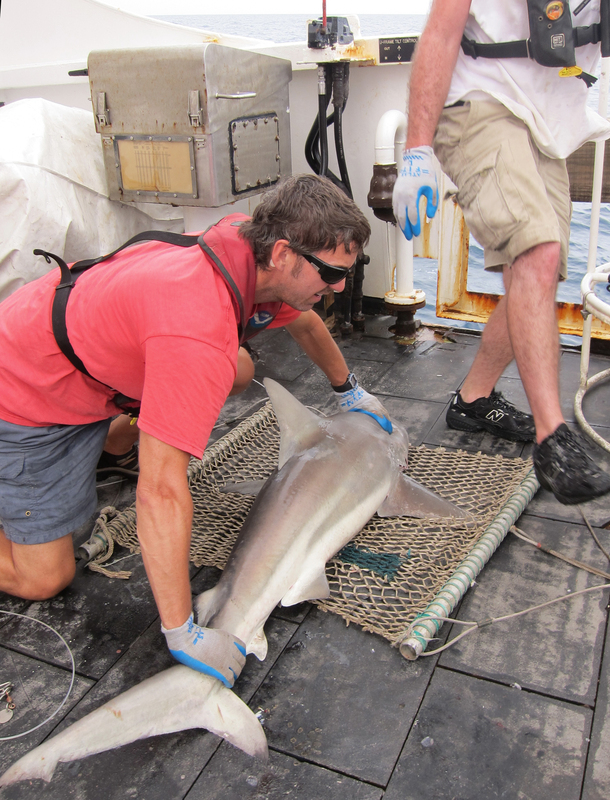 Collecting measurements from a large blacktip shark. Holding a blacktip shark before determining its weight. When a shark is too big to bring on deck safely, the shark is placed into a cradle and hoisted from the water so it can be measured and tagged. We have used the cradle on a number of sharks including a 7.5 foot tiger shark and a 6 foot scalloped hammerhead shark. When processing sharks, we try to work quickly and efficiently to measure and tag the sharks to minimize stress on the animals and time out of the water. 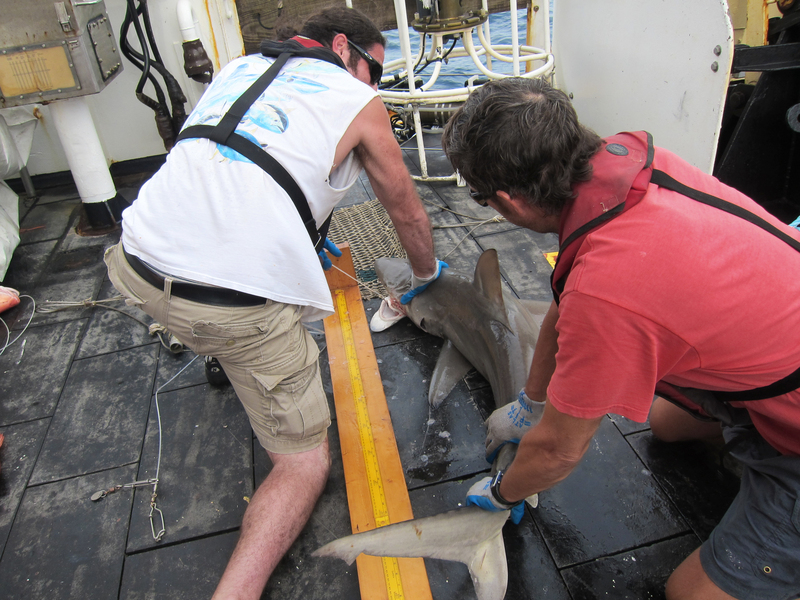 Once our data collection is complete, the sharks are returned to the water. 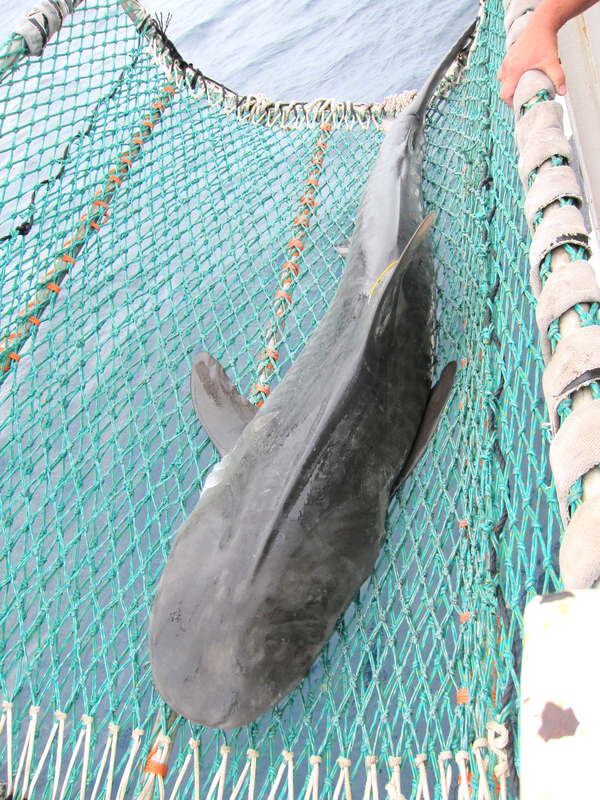 Large sharks, like this tiger shark, are hoisted up on a cradle in order to be measured and tagged. We are now in full work mode on the ship. My daily routine consists of waking up around 7:30 and grabbing breakfast. After breakfast I like to go check in on the night team to see what they caught and determine when they will do their next haul (i.e. pull in their catch). This usually gives me a couple hours of free time before my shift begins at noon. I like to use my time in the morning to work on my log and go through pictures from the previous day. I eat lunch around 11:30 so I am ready to start work at noon. My shift, which runs from noon to midnight, typically includes surveying three or four different stations. At each station, we set our baited hooks for one hour, haul the catch, and process the sharks and fishes. We process the sharks immediately and then release them, whereas we keep the fish to collect biological samples (otoliths and gonads). Once we finish processing the catch, we have free time until the ship reaches the next survey station. The stations can be anywhere from 6 or 7 miles apart to over 40 miles apart. Therefore, our downtime throughout the day can vary widely from 30 minutes to several hours (the ship usually travels at about 10 knots; 1 knot = 1.15 mph). At midnight, we switch roles with the night team. Working with fish in temperatures reaching the low 90°s will make you dirty. Therefore, I typically head to the shower to clean up before going to bed. I am usually in bed by 12:30 and will be back up early in the morning to do it all over again. It is a busy schedule, but the work is interesting, exciting, and fun. I feel very lucky to be out here because not many people get the opportunity to wrestle sharks. This is one experience I will always remember. 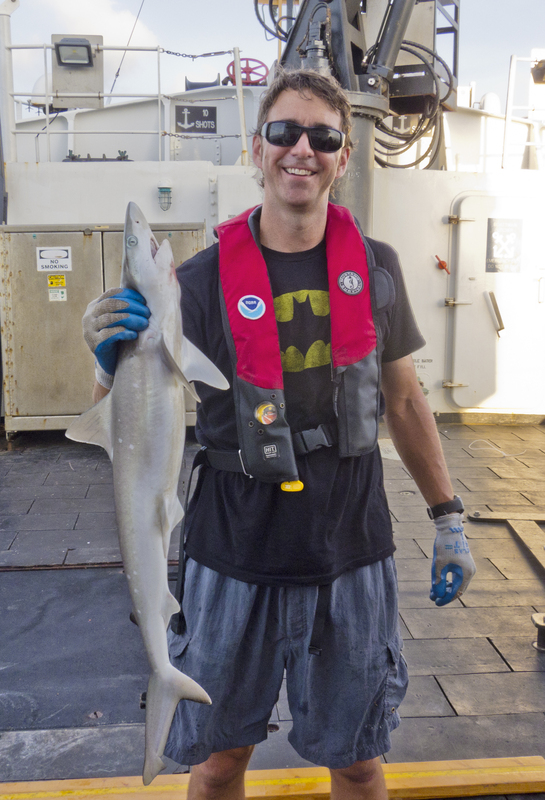 This entry was posted in 2015, Jeffrey Miller, NOAA, NOAA Fisheries Service, NOAA Teacher at Sea and tagged blacktip shark, Gulf of Mexico, Jeff Miller, longline survey, NOAA Ship Oregon II, NOAA Teacher at Sea, shark, sharpnose shark, tiger shark. Bookmark the permalink. This sounds like such a fun (and IMPORTANT) job! Are you fitting the sharks with tracking devices or just tags so they can be identified if caught in the future?